The recently completed St Francis Park Apartments. The Willamette Week reported that “one of the largest and most popular food cart pods in Portland”, located at 2880 SE Division St, is closing to become apartments. 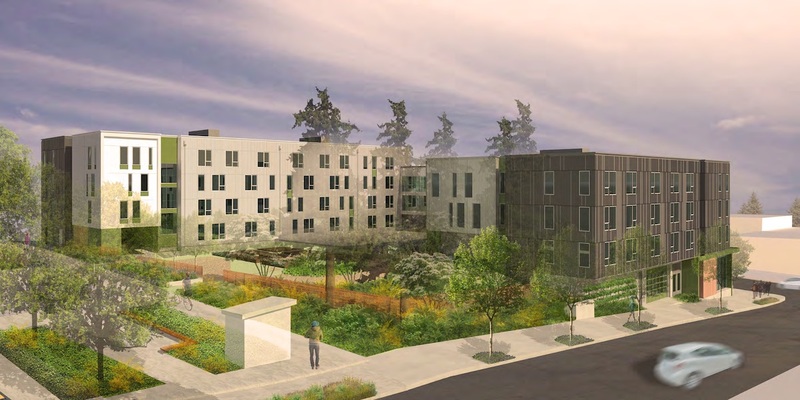 The Portland Tribune looked at the push by homeless advocates to ensure affordable housing developments include Permanent Supportive Housing units, such as those at the recently completed St Francis Park Apartments. According to the Oregonian, Amazon will be opening a pickup location near PSU in the ground floor of the recently completed Sky3 tower. The Willamette Week reported that critics are blasting a “plan to divert money earmarked for the black community to help a health care giant” at N Williams and Knott. According to the Portland Business Journal “no fewer than 27 hotels have either opened since 2015 or are under construction or planned for the metro region”. 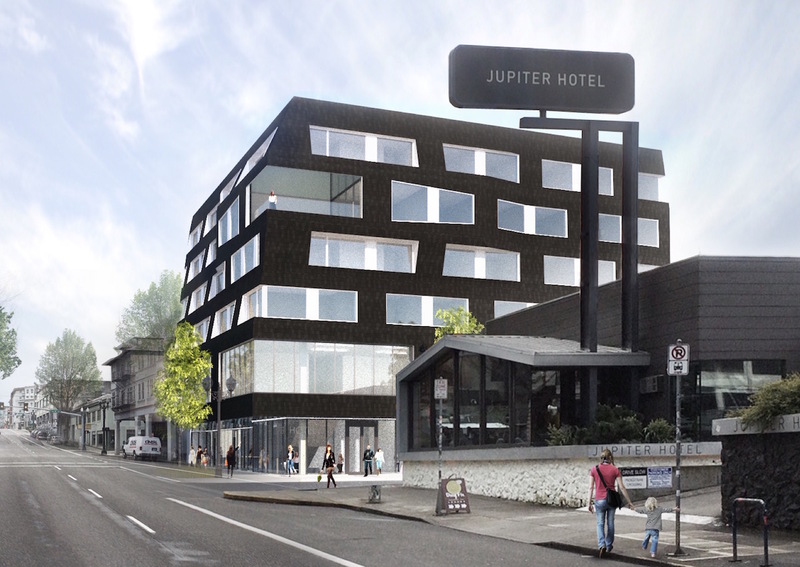 The paper published a gallery of the some of the hotel projects that are adding thousands of rooms to Portland. New Mixed Use Building on vacant sloping lot. First 2 stories office and retail top 2 stories will have 4-8 apartments. New 7-18 story Apartment Building – Timber (CLT) Construction – 2 levels for parking. 3 Development plans, some affordable housing proposed. New 4 story 18 unit apartment building. The project consists of a six-story approximately 200 unit apartment building with below-grade parking for approx. 118 vehicles. 4-story mixed-use multi-family apartment project with ground floor leasable space, lobby, MEP/Utility/Service space, and three elevated apartment floor levels (combo of studio and one-bedroom units for a total of 67 units). Onsite surface parking will be provided. They may need an adjustment to parking stall width. Redevelopment of middle school (Kellogg Middle School), either by new addition and renovations – or replacement of 100,000+ sq ft school. New 95 studio unit apartment building, no parking proposed. A eco roof for stormwater management with flow through planters in the courtyard to manage impervious areas outside of the roof. Proposal is new construction of a four story apartment building with 60 units with tuck under grade level parkiing. Existing parking lot to be re-striped to provide parking lots for both existing office and new apartment building. 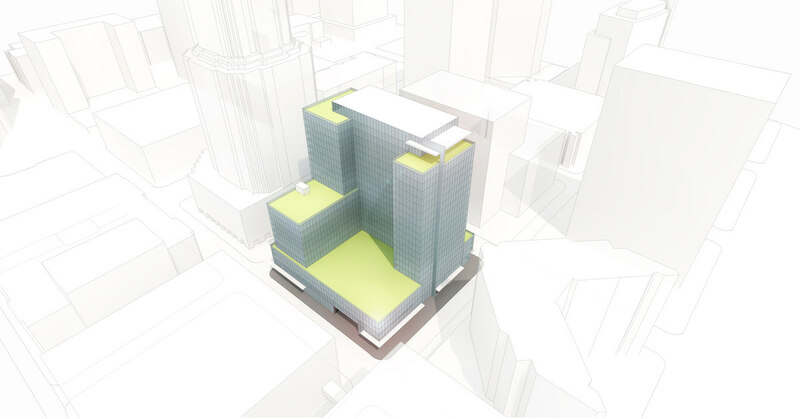 New 23 Story Mixed Use Building – Existing Historic Federal Exchange Building to remain on site. New multi-family residential development with ground floor retail and underground parking garage. 6 stories (67′ tall) with a combo of studio, 1 and 2 bedroom living units. new 17 story apartment building. 258 residential units are proposed. The first floor will have both residential and parking. There are 192 underground parking spaces. The access for the parking would be from NW Naito. Two loading spaces are proposed. The property will be divided to create a 79,700 square foot site for this development. Demo existing building, new development of 7 story 120 unit residential apartment building with ground floor retail and underground parking. 2 modifications , bike parking width &size of parking stalls. Construct new 6 story mixed use building, includes event space and restaurant, floors 3-6 are hotel rooms, no parking. Site work and stormwater management included.